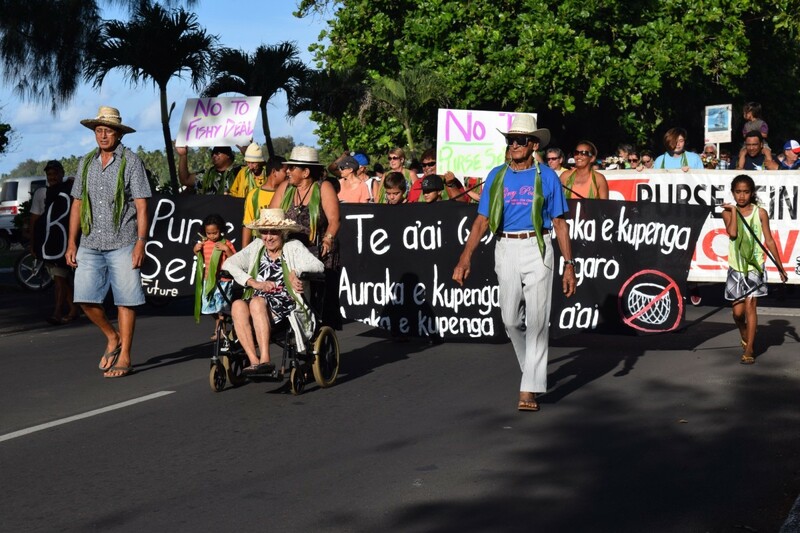 Tupe Short (right) leads a group of protestors in opposition to foreign purse seiners’ presence in the Cook Islands. On a balmy April afternoon, 76-year-old Tupe Short donned his cowboy hat and rubber flip-flops and rode his motorbike into Avarua, the capital of the Cook Islands, where shoes are optional and roosters regularly wander into restaurants. The son of a respected statesman, Short was there to join a protest, publicly opposing his country’s leaders — men he had known all his life — in their support for the licensing of foreign purse seiners, fishing boats with nets that cover up to a square mile of ocean. Short had already protested against purse seining on two occasions, in April and November of 2015. He had also signed a petition in July of 2015 demanding a ban on the practice in Cook Islands waters, writing his sub-chief title next to his name, beside 4,135 others. The Cook Islands government was, and still is, preparing to enter into a deal with the European Union, authorizing four more seiners — three Spanish and one French — to fish for tuna in its zone, a swath of sea larger than Texas. Short wasn’t fully aware of what was happening beyond the reef, but he knew that, although local fishermen weren’t catching fish like they used to, more big boats were turning up, searching for tuna to sell in Europe, Asia, and the United States. Purse seiners deploy sprawling nets that cinch at top and bottom, snapping shut like the drawstrings of a purse. They target free-swimming schools of fish and can operate sustainably. With new technologies, purse seiners attract all kinds of fish, making them considerably more likely to net bycatch — fish they don’t intend to catch, often juveniles and threatened species like bigeye tuna. Unlike other forms of fishing, the seiners don’t go to the fish; the fish come to them. Seiners aren’t new to Polynesia. When the U.S. 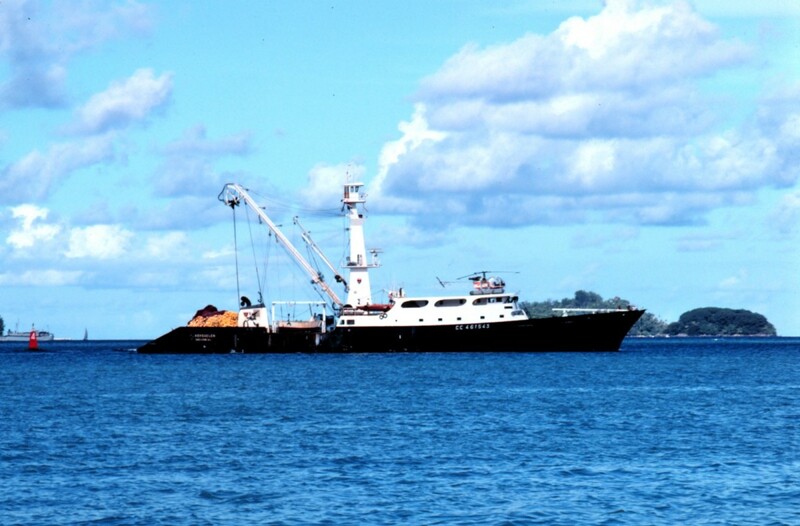 Fisheries Treaty was signed in 1987, American companies gained access to the waters of 17 Pacific nations. Soon there were commercial boats moving through the region, tracking the densest populations of skipjack tuna. Rarely did they fish in the eastern Pacific, where the Cook Islands are located; most preferred more productive fisheries in places like the Philippines and Indonesia. Probably 16 or 17 seiners passed through the Cook Islands annually. But in 2012, scientists published research confirming just how overfished the Atlantic and Indian Oceans had become, prompting regulations and interest in the Pacific. A couple of years later, technology advanced. Now the FADs — Fish Aggregating Devices, or floating buoys that attract fish — featured sonar capabilities, turning the seiners that used them into the world’s most efficient fleets, making it worthwhile for fishermen to venture into remote oceans. In 2015, the Pacific region entered the strongest El Niño cycle to occur since 1997. 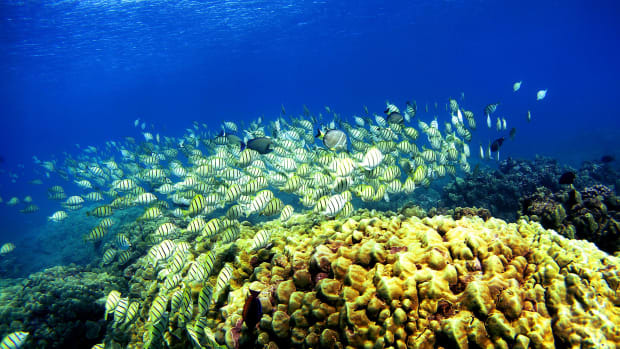 Seas in the eastern equatorial Pacific grew warmer, attracting more fish. The industry had been preparing for this shift, already negotiating agreements with nations expecting to benefit. Last year, 65 seiners — half American, half Korean — signed up to join a fleet of longliners in the Cook Islands’ fishing zone. “It’s the most purse seine activity we’ve had,” says Georgia Langdon, a senior fisheries officer for the Cook Islands government. The Cook Islands sold 60 percent of its fishing days (a quota allotted by the Western Central Pacific Fisheries Commission) and made NZ$10 million, most of it from seiners. Ten years ago, they say, fishing was easy. These days, they often return to the wharf with an empty hold. Subsistence fishermen face an uncertain future, marked by climate change and ocean acidification and global overfishing, and they suspect things are only going to get worse. Meanwhile they read about the Cook Islands fishery earning 10 times what it did a decade ago, in a time when the residential population was larger. Pupuke Robati, 47, has been a subsistence fisherman all his life. Now he takes tourists out on charters because he doesn’t catch fish like he used to, not enough to cover the cost of fuel, and he has five children to feed. The protests Tupe Short attended were organized by Te Ipukarea Society, an environmental non-profit based in Rarotonga. Kelvin Passfield, a former fisheries officer, is the organization’s technical director. For years he had watched from the sidelines, sometimes writing letters to the local paper, but then the Cook Islands government began negotiating with Spanish fishing companies that other Pacific nations refused to engage — companies with tainted track records — and so he planned a protest. 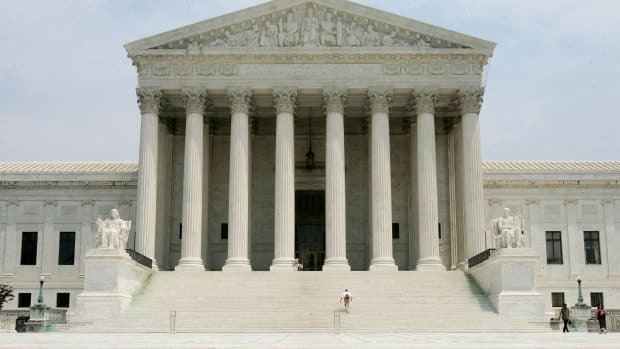 “[It] was like the straw that broke the camel’s back,” Passfield says. Initially the campaign opposed only those seiners fishing with FADs. Fisheries managers countered, through the newspapers and during public consultations, that banning FADs would send boats — and their licensing fees — elsewhere. Fuel is expensive and the Cook Islands are remote; commercial fishing companies say only an FAD makes the journey worthwhile. 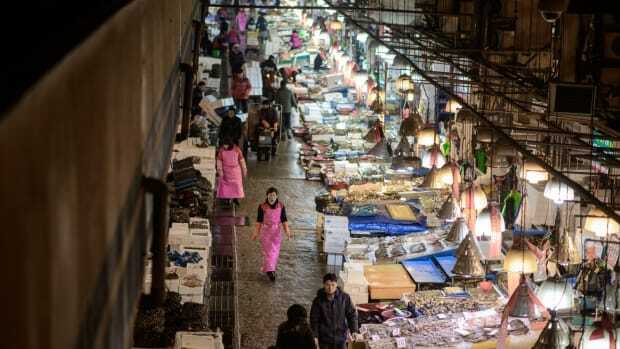 Fisheries managers also pointed out the country’s compliance with regional measures devised to manage FAD use, including a complete ban between July and October. A French tuna purse seiner. TIS took a harder line, attracting support by broadening its campaign to include all purse seining. In July of 2015, one-third of Rarotonga’s population signed a petition demanding the phase-out of purse seining. Another public protest followed, and then another. Fisheries officers say the protests were misguided, fueled by fear of the unknown — an understandable response to a changing climate. Most, if not all, are sympathetic to subsistence fishermen but say it makes little sense to blame some purse seiners for a complex regional issue managed by complex regional agreements. Working in fisheries means interpreting coordinates and log sheets to track where vessels are fishing and how much they’re taking. It means analyzing data to determine sustainable thresholds, measuring the influences of environmental change on the ocean, and monitoring the behavior of fish that roam freely around a space artificially divided by borders. Employees of fisheries whose job is to understand fishing say closing off the Cook Islands’ zone displaces the problem. The fish will still be caught, even if it’s further west. And if they’re caught further west, in the breeding grounds, any action the island nation takes would prove futile. “We’re a small player in a pretty big game,” says Josh Mitchell, who worked in the Cook Islands fisheries division for 20 years. The country’s zone represents 2 percent of the regional fishery. Half a dozen agencies, headquartered in places like Honiara and Suva, are working to coordinate marine conservation across the Pacific; last year there were 71 regional- and international-level meetings about tuna alone. But it isn’t easy to reconcile national, regional, international, environmental, and corporate interests. Despite TIS’s campaign, the government has not ruled out a deal with European companies interested in licensing four new seiners to catch 7,000 tons of fish a year for four years. Fisheries managers say a well-managed purse seine fishery can be both profitable and sustainable.